This it the first time I tried cooking with gluten free flour. I had actually misread the recipe and came up with something that is thicker than crepe, but thinner than pancake. Anyway, it tasted awesome. So I am keeping this half crepe, half pancake recipe. Mash raspberry with sugar and lemon juice in a small saucepan. Bring mixture to a boil over medium heat. Reduce heat and continue to simmer until sauce thickens. Set aside. In a medium bowl, combine flour, sugar, baking powder, and salt. Set aside. In a separate bowl, beat eggs, milk, canola oil, and vanilla extract until incorporated. Stir into flour mixture until combined. Run mixture through a sieve to obtain a smooth batter. Grease a 6 inch skillet with melted butter over medium high heat. Ladle batter into the skillet and tilt the pan so that the batter coats the bottom of the pan evenly. Cook until tiny bubbles start to form and the edges appear to be lightly browned. Flip and continue cooking until both sides are lightly browned. Repeat steps 5 – 7 until the batter is used up. Transfer to serving plate and garnish with fresh berries. Dust icing sugar over the pancake. 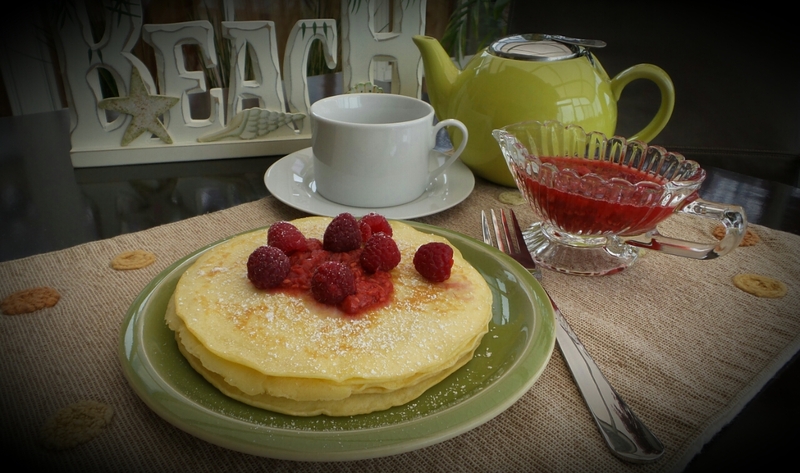 Serve warm with raspberry sauce.